Obese people could face cuts to their benefits if they do not agree to be rolled down a steep hill, under new plans being outlined by Home Secretary Amber Rudd. “There’s plenty of jobs out there for obese people. They can get jobs as 1970’s wrestlers, professional darts players or they can try their hands at being a chubby rapper like Biggy Smalls. Unfortunately some of our more portly benefit claimants think it’s fine to sit around eating sticky buns all day. And that’s fine. But if they want to receive social security benefits, they’re going to have to roll down a hill.” She explained. The plans have had the full support of Prime Minister Theresa May who told us “This report contains exactly the sort of bright, forward-thinking and radical ideas that need to be looked at.We have a great opportunity to improve lives and save money simultaneously. We were planning to do this by making exercise compulsory but the trouble with these fatties is they’ll just ‘say’ they’ve exercised like they ‘say’ they’ve tried dieting. 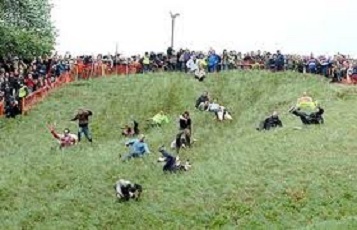 At least this way we all get to ‘see’ them rolling down a hill. It is not clear whether a ‘London Hill’ like Primrose or Muswell will be used, or whether the Government use one of Britain’s many ‘rural hills’. “Either way it’s going to have to have a dirty great bush at the bottom for them to crash into. Otherwise they’ll just keep rolling.” We were told.